Microsoft have begun turning off the lights on Games for Windows Live, sending developers scurrying for the bolt-jointed hydraulic arms of Steam. Latest to come in from the cold are Rocksteady. Their Arkham Asylum and Arkham City are now solely Steam games for the twin purposes of verification and updates, effectively immediately. There’s a frownsome addendum to that, though: your existing saves aren’t coming with them. If you’ve purchased either game in their base or Game of the Year editions on Steam, the changes will be made in a new patch downloaded without your even taking your finger out of your bottom. If you bought them somewhere else, you’ll simply need to enter the code in the Steam client via the usual box. Buh, thanks. Let’s roll back to that saves bit for a sec, though. A slightly roundabout means of recalling your Arkham City memories has been reported by fans on the Steam forums – but no similar fix has yet been found for Asylum. So that’s bum. Have you lost anything in the fire? On the bright side, you’ve an excuse to get some more practice in before Origins. 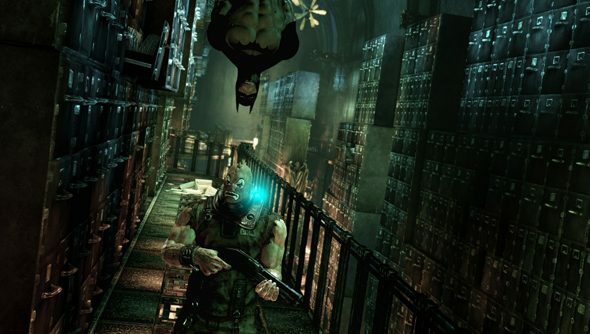 The series’ new developers don’t think Batman: Arkham City players were particularly good at it.